MILWAUKEE, WI – Aerostar Global/Suburban Motors H-D rider Steve Rapp rolled to a commanding fifth win of the season in the AMA Pro Vance & Hines Harley-Davidson series at New Jersey Motorsports Park as he edged closer to claiming the 2013 series championship and $25,000 top prize with one race remaining in the four-race XR Showdown. As he has done in most of his previous wins this year, Rapp started from pole position, opened a gap on the field from the drop of the green flag, and stretched his lead through to the checkered flag in metronomic fashion, never putting a wheel wrong as he led all 11 laps of the race. But if Rapp's victory was practically a foregone conclusion, the racing for second and third was anything but, as a train of up to seven riders battled for the remaining podium positions until the final lap. Multiple riders jockeyed for position in the lead pack as the laps wound down, but when the checkered flag flew, Tyler O'Hara (Eco Fuel Saver/Scrubblade) drafted past MOB Racing's Eric Stump to take the second step of the podium by a 0.038-second margin, as Stump secured his best finishing position of the season. Brothers Travis Wyman (Harv's H-D), who ran as high as second late in the race, and Kyle Wyman (Kyle Wyman Racing), who charged through the field from the last starting position on the grid, rounded out the top five a few tenths of a second behind. "We made a few changes this morning and it was definitely an improvement over what I had been riding. We're always making the bike better, just getting confident, knowing the limits of the tires and the bike. I've done well at this track before and that was a good confidence builder coming in," said Rapp, who now holds a 22-point lead in the rider standings with one race remaining in the XR Showdown. 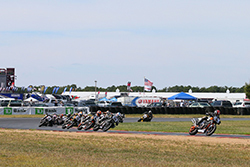 The 2013 AMA Pro Vance & Hines Harley-Davidson series concludes September 28-29 at Mazda Raceway Laguna Seca in Monterey, Ca. with the final round of the XR Showdown. 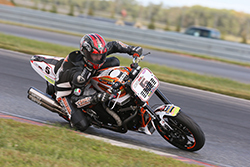 The Harley-Davidson Screamin' Eagle/Vance & Hines Pro Stock Motorcycle team is sponsored by Dunlop and Traxxas.